Hello one and all! My name is Pete “TitansCreed” Nethercote, and I’m delighted to confirm that the cosplay competition at Summer of Sonic is definitely happening this year. We’ve had multiple questions from curious Mobians and Badniks alike, and you bet that the team are more than happy to give you the low down on how this year is going to go! I want to cosplay! Where do I sign up? There will be a signup booth close to the entrance of the venue, which will be open for signups until lunch. All entrants (depending on number of signups) will be divided into groups which will be called upon later in the day for preliminary judging. You’ll be given a group name and a time to return to the booth, but don’t worry! We’ll announce when it’s time for each group to come up for the initial judging rounds. Why do we need preliminary judging? Because there’s simply too many fantastic costumes to fit on one small stage! But don’t worry… you’ll all be given your moment to shine in the group stages, and there’ll be plenty of opportunities for photos! What are you looking for when judging? Now, what do those mean? In terms of all those items, we, as the judges, are aware that entrants will vary between age groups and take that in mind when judging. All those terms are basically asking is that you put your all into becoming the character you are aiming to cosplay. Do you know what the timetable for the day will be? As we come closer to the launch of Summer of Sonic, we’ll have more concrete times for sign-ups and judging. These will be timetabled for your reference, so don’t worry about missing a thing – we’ve got it covered! The judges till be myself and Ciara “Nemain” Thrush, who have been the people at the helm of the contest in previous years. However! We are also proud and excited to welcome Claire Cameron to the team this year, who is one of the co-organisers of Weston-Super-Sonic (and an absolutely rockin’ Excalibur Sonic cosplayer to boot)! Will there be changing rooms/cloakrooms? There is a cloakroom upon site, we will ask if we can use these facilities for changing for cosplay purposes. When we have more information on this, we will share with you all. If anyone has any further questions, please feel free to leave them in the comments below, and we’ll try to answer as many as we can in a follow up post. Stay way past cool, folks! TitansCreed, on behalf of The Summer of Sonic Cosplay Team. Our team are hard at work preparing the process of arranging your tickets for Summer of Sonic, and we will be informing you on all the juicy details very soon. Again, thank you for your patience! Today we have our next guest announcements! We are pleased to welcome illustrator Duncan Gutteridge to Summer of Sonic 2016! Duncan is best known for his illustration work in the 90’s, which have become some of the most recognised images from the early days of the blue blur after being widely used on calendars, books and a whole swathe of merchandise. Duncan’s portfolio also includes artwork for Echo the Dolphin and Streets of Rage. We also wish to welcome James Wallis to the Summer of Sonic roster! 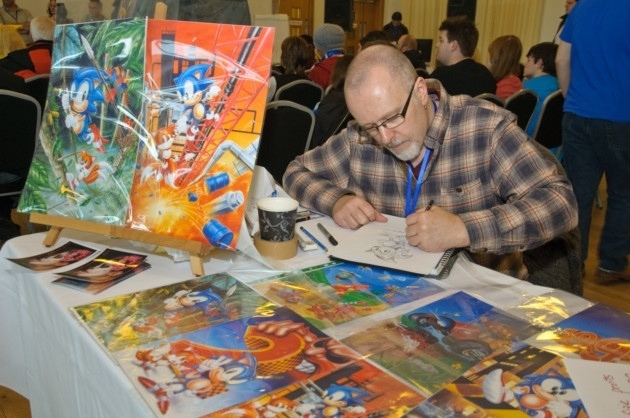 Older fans will remember James’ work on Sonic the Hedgehog Adventure Game books Metal City Mayhem and The Zone Rangers, along with two of the Sonic storybooks published by Virgin books under the pseudonym Martin Adams. James also has an extensive background in writing, publishing and designing games, both traditional and digital.